The Mars Reconnaissance Orbiter (MRO) began its high-resolution imaging of Mars on November 7, 2006. The MRO carried a camera with a resolution capability of up to 25 cm per pixel, which is good enough to spot natural arches if they are visible from above. 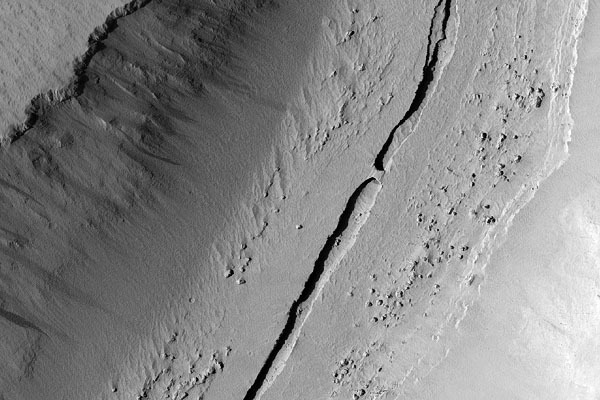 After only one week of operation, on November 15, 2006, MRO took the above photo of what seems to be a natural arch spanning a collapsed lava tube in the Tartarus Colles region of Mars. We may not know for sure until ground-proof is achieved (the webmaster volunteers for this if someone else will arrange for transportation and lodging). See Jay Wilbur's article on Probable Aspects of Natural Arch Formation on Mars for discussion of how natural arches might form on Mars and the clues they can provide toward an understanding of the recent history of the Martian surface. A recommended book on Mars is A Traveler's Guide to Mars by William K. Hartmann. The description of the Mars image below comes from the High Resolution Imaging Science Experiment (HiRISE) Operations Center of the Lunar and Planetary Laboratory of the University of Arizona. 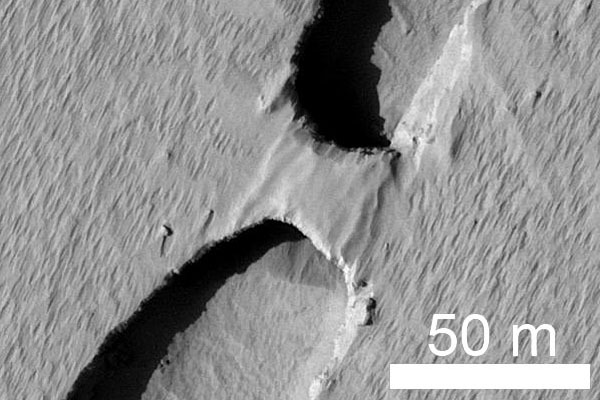 The wider views below show a narrow trough running down the center of a valley that lies between two hills in the Tartarus Colles region of Mars. 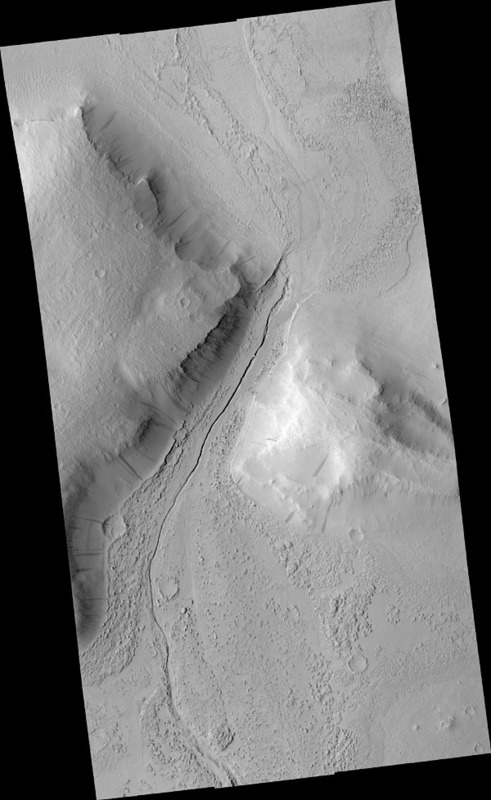 Lower resolution images acquired by earlier spacecraft showed that a platy-ridged flow, perhaps of lava, ran through this valley before solidifying. However, at higher resolution the dominant textures on the valley floor are not rafted plates and arcuate ridges but scallops in the dust that blankets the surface and rocky knobs that poke through much of the dust. 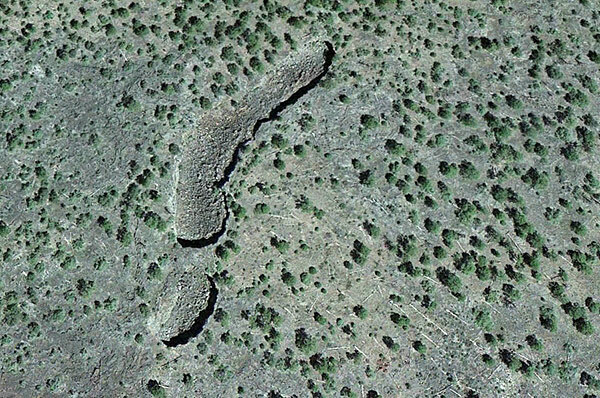 Several of the knobs are boulders that tumbled downhill in a process known as mass wasting, which has widened the valley over time. The prominent trough in the middle of the valley is about 40 m (130 feet) wide, and it is not entirely continuous. Two trough segments terminate in blunt ends that are separated by a natural bridge or wall of material 23 meters (75 feet) wide. 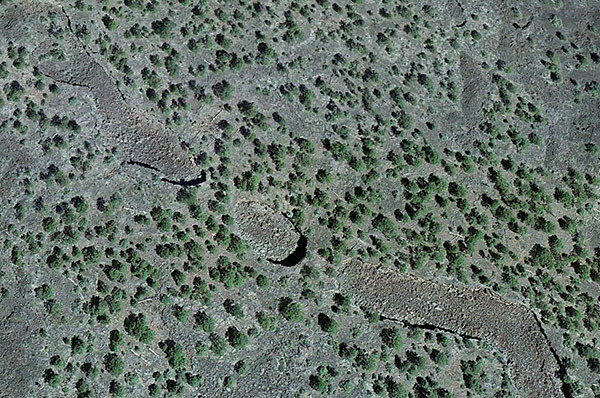 Given the broader geologic context, it is likely that this trough formed as a lava tube and that its roof has mostly caved in over time, leaving only a small section standing. Lava tubes form when the top and sides of a "river" of lava freeze while molten rock continues to flow through its interior. After the eruption ceases, molten lava flows out of the tube leaving it empty. Tubes require a steady and sustained flow of lava to form, and they allow the lava to be transported a considerable distance without losing too much heat. The full image, number PSP_001420_2045 shown below, was taken by the High Resolution Imaging Science Experiment (HiRISE) camera onboard the Mars Reconnaissance Orbiter spacecraft on November 15, 2006. The complete image is centered at 24.5 degrees latitude, 188.1 degrees East longitude. The range to the target site was 288.9 km (180.6 miles). North is up. The image was taken at a local Mars time of 3:23 PM and the scene is illuminated from the west with a solar incidence angle of 48 degrees; thus the sun was about 42 degrees above the horizon. At a solar longitude of 135.6 degrees, the season on Mars is Northern Summer. 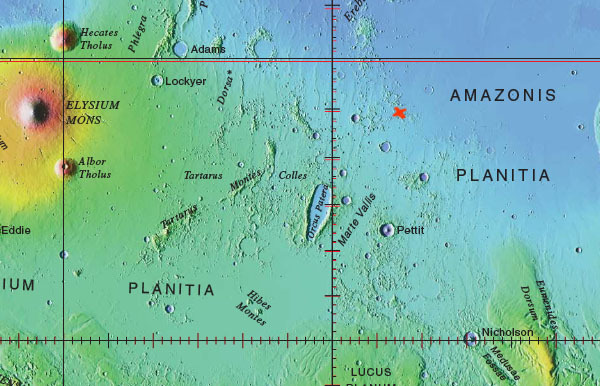 Below is a section of a topographic map of mars where the red "x" shows the approximate location of the potential arch.